Art Review: Danilo Gonzalez & Christopher Griffin, new paintings. West Branch Gallery & Sculpture Park, Stowe. West Branch Gallery & Sculpture Park in Stowe features two strong painters this month in an exhibit with the intriguing title “The Temperature of Color.” Canadian artist Christopher Griffin and Danilo Gonzalez of Burlington have shown internationally, and, though their works are quite different, they complement each other in this shared exhibit. Both use lively lines and a limited range of hues to interesting effect. In his artist’s statement, Gonzalez cites a particular interest in Picasso, and that seminal force is most evident in his series of expressively painted heads. “Head IX” is a 50-by-56-inch canvas filled with a large countenance. Gray and pale-brown earth tones within simple outlines describe the figure; illegible script runs along the lower area of the piece. The 42-by-54-inch “Head X” is made up of cerulean-blue negative space and patches of grayish skin tones. These line drawings do recall similar works by Picasso. In addition to the large-scale pieces, Gonzalez includes six 11-by-14-inch heads on paper that are pictorially more complex, with a broader range of mark making. Numbered I-VI, they are compositional and conceptual precursors to the large heads. 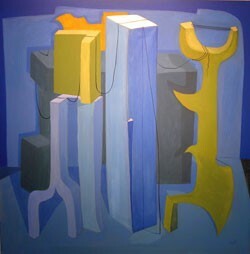 Other Gonzalez paintings are labeled “Interiors” or “Exteriors.” “Exterior 5” is a 48-inch-square acrylic populated by vertical shapes in a cubistic space of blue shades. Two green forms and an orange biomorphic element, sited more deeply in the picture plane, create a triadic harmony. Gonzalez plays with mass in the painting by letting fine lines dangle off the forms like drooping string. “Interior 5” is a monochromatic, 50-by-40-inch vertical composition in red. Again, Gonzalez contrasts fine lines with dimensional objects — in this case, tall beams in vaguely two-point perspective. But, as if to illustrate the show’s title, “Interior 5” is burning hot. The artist’s use of just a few shades of red heightens the intensity of that passionate hue. Animals are a prominent theme for Griffin; “they represent the pure, the innocent and the spiritual,” according to his artist’s statement. He is apparently also enamored of cave paintings — that prehistoric aesthetic is particularly discernible in Griffin’s 24-by-36-inch “Dusty Sky.” The oil-on-canvas painting is dominated by a large expanse of white-on-white “sky,” while a herd of seven primitive bison trot along the bottom edge. This work seems influenced by the animal drawings in the Grotte de Niaux in the French Pyrénées. Griffin’s creatures are rendered in burnt umber and shrouded in an umber mist, as if sprayed with a Cro-Magnon atomizer. “Heading to the Front” uses cave painting as a point of departure. The 36-by-24-inch canvas presents a hulking bison in a more frontal pose than those usually seen in Upper Paleolithic art. Again, Griffin’s earthy hues lend an ancient sensibility to the piece. His use of line to create tensions within the animal’s form, however, is his own invention. Griffin’s palette brightens in “Green Land,” a 44-by-60-inch mystical vista of emerald greens, pale blues and translucent whites. A stick-figure deer appears at the right of the image, and abstract patterns of irregular dots and lines flatten the picture plane. Griffin also mentions children’s art as a visual resource, and certainly in “Green Land” he blends the art of childhood with primitivism in a provocative way. He may be implying that humanity’s earliest examples of visual art reflect a nascent cultural awareness similar to what children experience in any era. Gonzalez and Griffin both paint with an eye to history as they conjure contemporary figurative imagery. The spaces they create are neither shallow nor particularly deep. The same may be said of the paintings’ content, but there’s nothing wrong with beautiful simplicity.